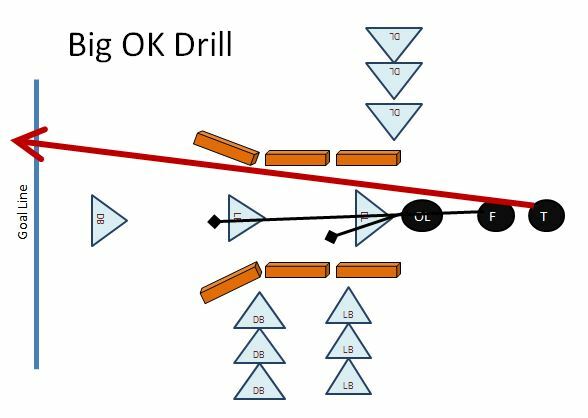 One of my favorite youth football drills is the Big Oklahoma Drill or the Big OK. This drill is second only to the SUMO drill that I run if we win a game. I first heard about the Big OK drill from Coach O in Denver Colorado at a Coaches Seminar. This drill gets everyone involved and can be an offensive drill or a defensive drill or both. You need three coaches to run the drill so you can grade all aspects of the drill. I usually have one coach watch the lineman, one coach for LBs and one coach for DBs. You could also have one coach watch the running backs. There are three lines and they rotate in for DBs, LBs, and Lineman. The DBs rotate at TB, LBs and FB and DL at OL and or run an offense squad vs a Defensive squad. The Tailback runs the ball and the OL and FB block for the TB. The DL must stuff the blocker, linebacker stuffs the lead blocker at LOS and Defensive back watches over flow. If the TB crosses the goal line the defense does 10 push ups. This youth football drill is great because very few players are standing around, almost everyone is involved or just off a rep. You can watch blocking, tackling and running technique and grade all of them if you have enough coaches. I have run the drill alone but you miss some things. Play for Fun but Winning is Funner!